Hello my fellow Guardians! After playing and loving destiny extensively as I am sure most of you have too I wanted to share some tips and tricks i learned from grinding out those post 20 levels in no time! I intend this to be for new and experienced players alike so there will be some kinda no brainers that not all people know thrown in here as well. You are here! Welcome to level 20! But what now? Well now that you are level 20 you have to obtain “Light Armor” or armor that gives you bonus light to obtain the post level 20 “Light Levels”. You can acquire this armor in many different ways but I have found A few that have worked really well for me. The strike playlist can be a sure fire way to earn that extra light you have been desperately needing for two reasons. One being that upon completion of the strike playlist you can be awarded really good items that will usually contain light. Secondly there is an abundance of Engram drops during these instances that can also give you really nice drops. The most guaranteed way I have found of getting a legendary piece of armor will really good light stats. So I would suggest looking up the 3 factions that are located at the tower(the New Monarchy left of the speaker left side if tower Executor Hideo, Dead Orbit on theleft side of the tower down the second ramp in on the left, and the New War Cult also located on the left side of the tower up the third ramp to the left and up another ramp into the “club” area. All of the vendors sell armor and weapons that can be purchased once you get high enough reputation. You can earn reputation for the faction you choose by purchasing their “mark” or “tabard” of sorts which converts all the rep you would usually earn from bounties and other such tasks to them. Alright I got the gear now what? Well now you need to upgrade the gear to its max light potential. That is right I said maximum potential, you see when you get a light piece it can gain even more light when you upgrade it through the in item upgrade tree. This can take a piece that would normally give you around +7 light to something like +10 light. Though it may sound easy upgrading is a whole can of worms on its own as depending on the rarity of the piece you may need many different materials spread throughout the galaxy. As from what I can tell Uncommon items(green) usually only take glimmer to upgrade and Rare(blue) items take glimmer and item specific parts such as Weapon Parts orPlasteel Plating(Titan) Sapphire Wire(Hunter) and Hardonic Essence(Warlock) that you can harvest from breaking down any other item of that class (ie. Weapon parts come from weapons Plasteel Plating from armor). Legendary(purple) or Exotic(yellow) can require a multitude of different materials on top of the ones already mentioned from those you can harvest on planets like Spirit Bloom and Spinmetal to items you can only get from engrams or post match drops such as Ascendant Energy. These can take a while to upgrade but are well worth as they give you the must light. A couple of FAQ’s that I have heard so far and helpful things I have found out. Welp now that I am level 20 guess exp is useless. 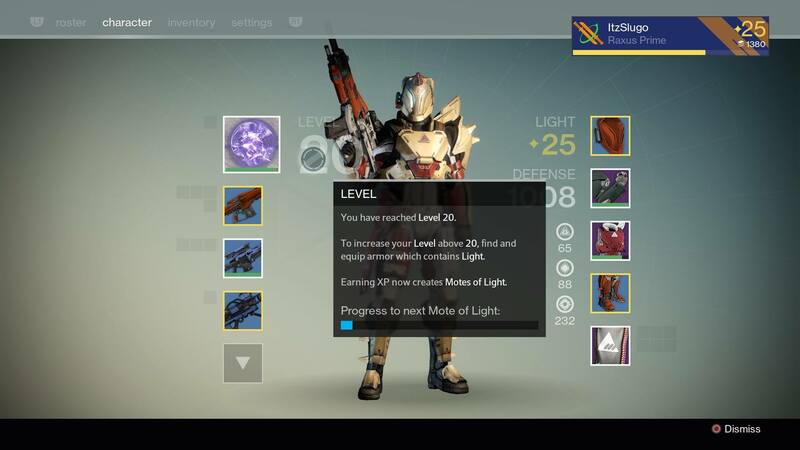 Well thats no actually true as all the XP you earn post 20 goes toward earning Motes of Light you can actually check your progress to your next mote of light by hovering over your level in your player screen here. How can I check my light level and how much light I currently have? In same menu screen as where you can check your level you can go to the golden number on the right hand sight which will show you your progress until the next light level as well as how much light you have equipped. Leveling this faction is taking forever! Anyway to speed up the process? Yes and no. Like most good things in life and destiny(whats the difference right?) there is gonna be some hard work and grind in getting up that level the biggest thing I can say is hit the crucible and grind its bounties as well as reputation bonuses(You can also get reputation from normal bounties as well). It should also be known that patrol quests earn you 10 rep a pop so those can help out as well when in need of less than 50 quickly. What do all these stats even do anyways! It is good to know what all tose extra stats on armor can do for you as it will help you create a build that suits your play style more than others and as mentioned above leveling high tier armor can take a while and would be a shame to have a stat you wont take advantage of. If you check your character page and hover over the 3 circles just left of your armor pieces it will tell what stat lowers the cool down of that corresponding ability your guardian has. Another thing to note is keep in mind that when going for an end game type armor set before leveling it make sure it has abilities you will use such as if you are a hand cannon/pulse rifle type guy you probably won’t make too much use of that auto-rifle CDR reduction ability. These type of things can make ALL the difference on late game raids and strikes. Well that about does it on my end if you see anything I am wrong about or want to add anything you think my help then feel free to comment and I will edit the post I hope this really helps out and happy hunting Guardians! Joining a faction straight away isn’t the best idea. It essentially means your vanguard marks are useless and any Vanguard rep you already accumulated is put to waste because you can’t spend the vanguard marks. Get the Vanguard to level 3 before joining a faction. The main stat you need on gear after level 20 is Light, and the only benefit to faction gear over the Vanguard gear is that you can choose the other two stats you want to focus on, which has very little impact on how effective your character is. Faction gear is more about building your character around a specific playstyle, which you’ll have time to do once you’re properly geared, however, in the meantime, a new level 20 should focus solely on Light, at least until they get a full set of legendary armor. Faction armor should be a goal for characters who are already high Light level, but who want gear that better suits their ideal playstyle. Either path you choose what should be known is the constant! Reputation = Armor = Level Gains.